When a Spanish grandmother attempted to restore the Ecce Homo fresco hanging in a little-known Spanish church—turning a picture of Jesus in a crown of thorns into a smudged simian—her spectacular failure became a global Internet phenomenon. Local Chinese officials responsible for the restoration of the Chaoyang Temple in Liaoning Province had better hope the same does not happen to them. The restoration of a fresco at a pagoda there, dating from the Qing Dynasty (1644–1912) has in turns infuriated and amused Internet users, and led to the dismissal of two officials in the city, according to Global Times, a state mouthpiece. 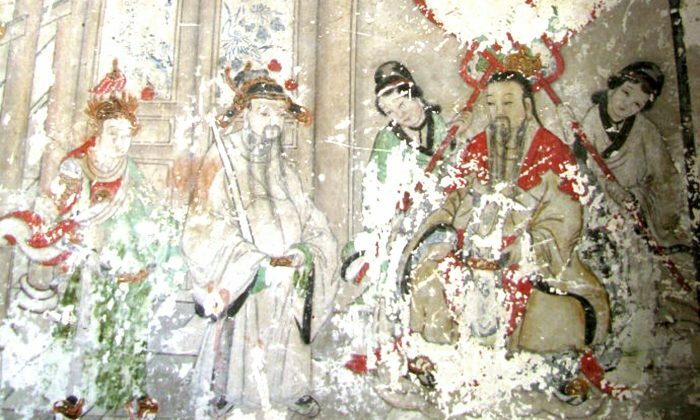 Cultural officials had allowed the painting over of a delicate Buddhist mural, which had faded somewhat over the centuries, with a garish, cartoon-like procession. Wu Jiao Feng, an Internet user, drew attention to the change in an Internet post called “The detestable restoration of Chaoyang Yunjie,” the name of the temple, which is a popular tourist destination on Phoenix Mountain in Liaoning Province. The site lies around 300 miles northeast of Beijing. “I went to the pagoda of the Chaoyang Yunjie Temple in 2011, and visited again recently,” he wrote. “I was amazed at the small temple from the Qing Dynasty under the pagoda. Staff at the temple told Liaoshen Evening News, a local newspaper, that the work was carried out by a professional painter who based it on the original fresco, and that they were satisfied with the work. Liaoshen Evening news reported, however, that those responsible for ordering the renovation work had no qualifications to do so. What was supposed to be a touchup painting instead ended up being a new painting that went right over the original. “It is absolutely forbidden to paint over an original painting. One can only make minor changes to the damaged areas, and clean off dust,” said Zhao Xu, an expert in fresco restoration at the China Central Academy of Fine Arts, in paraphrased remarks to Liaoshen Evening News.